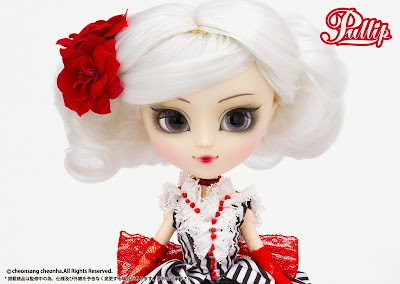 I'm excited by the new Scarlet doll from Groove, a Pullip dressed in a gorgeous black and white striped dress with red skirt and red gloves. She features white hair and gray eyes. She wears tiny fishnet stockings, too! Pullip Scarlet is due to arrive in October 2014.